Born in Boulogne-Billancourt in 1938. He lives and works in situ. 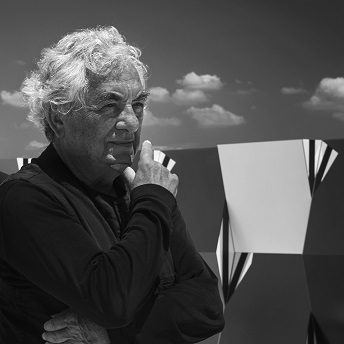 Daniel Buren is one of the most renowned artists on the international art scene, and one of its most prolific. His works have been displayed in over 1,500 exhibitions, a third of which were personal exhibitions, throughout the world. From fly-posting on major cities’ walls in the 1960s (Paris, Berne, New York, Kyoto, and more) to major public commissions, from private galleries to museums, all of his works were designed to fit in with the place in which they were to be displayed and were created in situ. Public commissions led to the creation of permanent works, the most famous of which include: “Les Deux Plateaux” in the inner courtyard of the Royal Palace in Paris, “25 Porticoes: la couleur et ses reflets” (colour and its reflections) in Odaiba, in Tokyo Bay, “Arcos rojos” at Puente de la Salve in Bilbao and “Diamonds and Circles” on Tottenham Court Road Station in London. He won the Golden Lion Award for the best pavillion at the Venice Biennale in 1986 and was awarded the Praemium Imperiale for Painting in Japan in 2007. His latest personal exhibitions included: A fresco at the Palais des Beaux-Arts in Brussels in 2016, ‘L’Observatoire de la lumière’ at the Vuitton Foundation in Paris in 2016-2017, and ‘Como un juego de niño’ at the Museo Espacio in Aguascalientes (Mexico) in 2016.